Every successful team has a goal. Our number 1 goal is to eliminate accidents; preventing not only the unsafe acts but also the unsafe conditions, and creating safe habits in our associates that help them to become a safe person. Conceived by and developed through the in-house collaborative efforts of many, our "12 Steps to Zero Accidents" Safety Program is designed to do just that: to create and then maintain an environment where accidents ~ and the potential for accidents ~ simply do not occur. 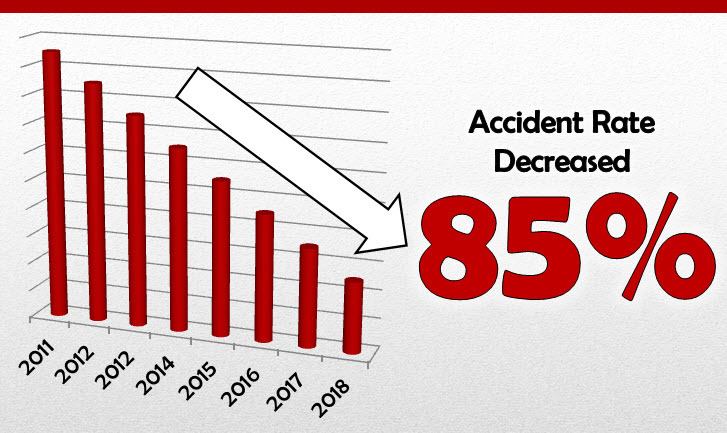 Since it's implementation in 2011, our accident rate has decreased nearly 85%. Our goal - that accident free End Zone - is just within our grasp because we focus diligently on carrying that winning safety spirit and not dropping the ball! TheZero Zone is powered by people - OUR amazing people ~ who have taken personal responsibility for the safety of themselves and those around them. It's a TEAM effort! Copyright 2018 IH Services, Inc. All material contained within this website and as part of the 12 Steps to Zero initiative, including concept, design, text, images, logos and sounds, are owned by IH Services, Inc., either through copyright or trademark, unless otherwise indicated. All rights are reserved by IH Services, Inc. Content may not be copied, reproduced, transmitted, distributed, downloaded or transferred in any form or by any means without IH Services, Inc.'s prior written consent, and with express attribution to IH Services, Inc.